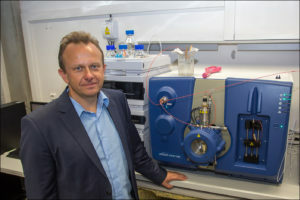 A novel method for early cancer diagnostics has been developed at University of Pardubice, and partnered with i&i Prague incubator. - i&i Prague, s.r.o. A novel method for early cancer diagnostics has been developed at University of Pardubice, and partnered with i&i Prague incubator. Pancreatic cancer is one of the most dangerous and most aggressive types of cancer. According to recent data, the twelfth most common malignant disease in the world. It is also associated with a high mortality rate, and it is the seventh of the most common causes of deaths for both sexes in cancer in general. In addition, the incidence has increased in recent years and can be expected to move to the third position ahead of breast cancer. Scientific teams around the world are looking for methods for early diagnostics of cancer. Among these is the team of Prof. Michal Holčapek of the University of Pardubice. „We have developed new methods for the lipidomic analysis of body fluids, predominantly blood, which distinguish patients with several types of cancer from healthy volunteers. We are currently working on pancreatic cancer data, where early diagnosis in early stages is the only chance for survival, “ described Prof. Holčapek the goal of the project. The research project of Prof. Holčapek has been awarded the European Research Council (ERC) grant and has been financially supported by the Ministry of Education of the Czech republic. Recently, the University of Pardubice has signed the memorandum with Czech Biotech incubator i&i Prague establishing a strategic collaboration towards further commercial development of the technology in order to introduce the novel diagnostic methods into the world market. i&i Prague is going to support the project with 20k EUR in the very first phase to ensure the business plan development and to cover further analyses to verify the commercial potential of the method and develop solid patent protection of the technology. „Ones we are able to confirm the potential of the technology, we are ready to invest up to 200k EUR in this project and invite further co-investors,“ commented Jaromír Zahrádka, CEO of i&i Prague, adding at the same time: “ Prof. Holčapek’s project is a world-class science. However, it need to be properly developed to become the comprehensible and ready-made business opportunity for investors and corporate partners. This is a necessary step to offer this promising technology to patients in future „. „The accuracy of our method is more than 90% for the very first stage of pancreatic cancer. However, the accuracy of other state-of-the-art and promising method was reported to be only 43%, according to the results published in Science magazine. The high accuracy of the method for early stages is a key parameter. Early diagnostics in oncology is crucial to improving patient prognosis and increasing survival chances, “ commented further Prof. Holcapek a key competitive advantage of his technology. The project is currently undergoing the clinical testing and beside the pancreatic cancer detection, highly promising results has been obtained for other cancer types which uncovered a potential for further exploitation of the technology. 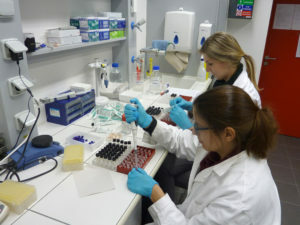 Biotechnology Incubator i&i Prague supports projects by scientists and researchers focusing on technologies in medicine, biotechnology, diagnostics and drug development. It takes care of the business part of the projects, leads and plans their business direction, looks for partners and takes care of technological marketing.